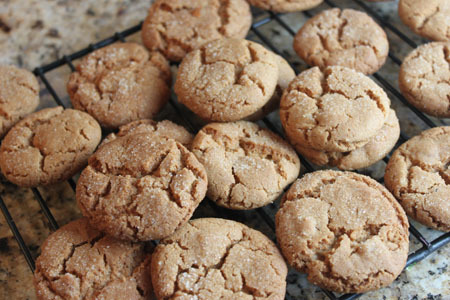 Crispy ginger cookies made with powdered ginger, fresh ginger and crystallized ginger. Preheat oven to 350°F. Line 2 rimmed baking sheets with parchment. Whisk first 6 ingredients in medium bowl. Using electric mixer, beat sugar and shortening in large bowl until fluffy. Beat in molasses, egg, and fresh ginger. Stir in crystallized ginger, then dry ingredients. Fill small shallow bowl with raw sugar. Using moist hands, shape 1 teaspoonful dough into ball; roll in raw sugar. Place on prepared sheet. Repeat with remaining dough, spacing cookies 2 inches apart. Bake cookies until golden and dry-looking, about 15 minutes. Cool on sheets. Not sure of the yield on this one.